Adds color changes to the Source clip using the color changes from a second Match clip. 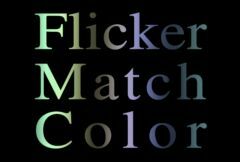 Similar to FlickerMatch but the process is applied to each color channel. To use this effect, first position the rectangle over an area of the Match clip which has color changes you want to copy. A middle or light gray area is best for this. Then select a frame for which you want the Source color unchanged, and hit the Set Match Level button. When you process other frames, the Source colors will be scaled by the average Match color within the rectangle, relative to the Match Color. Source: The current track. The clip to add color changes to. Match: Selectable. The clip to copy color changes from. Pressing this button sets the Match Color parameter to the average Match clip color in the rectangle at the current frame. It causes the output to equal the Source at this frame.